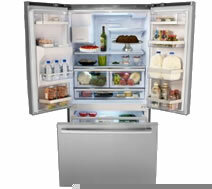 Jenn-Air’s line of built in refrigerators are one of the most premier and reliable brands on the market. Built in units offer two simple options, either a stainless steel exterior or a custom panel that is designed to match your cabinets so that your Jenn-Air fridge will blend into your kitchen for a chic appearance. Freestanding Jenn-Air refrigerators are high quality appliances on their own virtue but tend to be slightly less so than their built-in cousins. 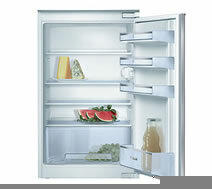 Jenn-Air freestanding refrigerators sit flush with cabinets but can easily be pulled out if needed. 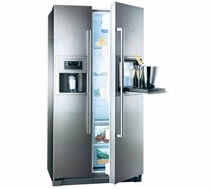 Jenn-Air French door fridges are the most high end style of refrigerator that Jenn-Air has is manufacturing at the moment and they ordinarily possess more features than other models under the Jenn-Air brand. Jenn-Air Side by Side refrigerators make the best of the advantages that this style has and copes with disadvantages by offering a lot of slots to customize shelf placement . 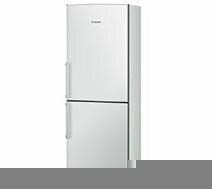 Side by Side refrigerators divide a refrigerator vertically rather than horizontally with the freezer on the top or bottom.